So this run was supposed to be easier than Indian Creek upriver, but this was inaccurate. 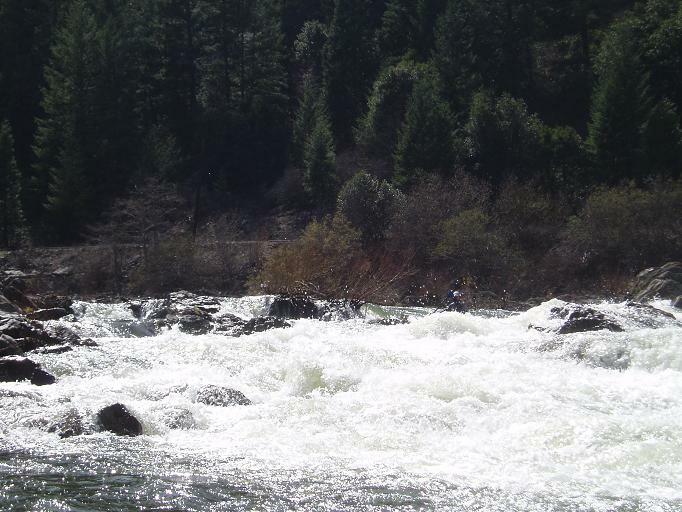 The rapids were larger, longer, had more moves, and contained many more consequences. We had about 875 cfs on Dreamflows, and this estimate seemed reasonable, if anything it might have been just a smidge higher. 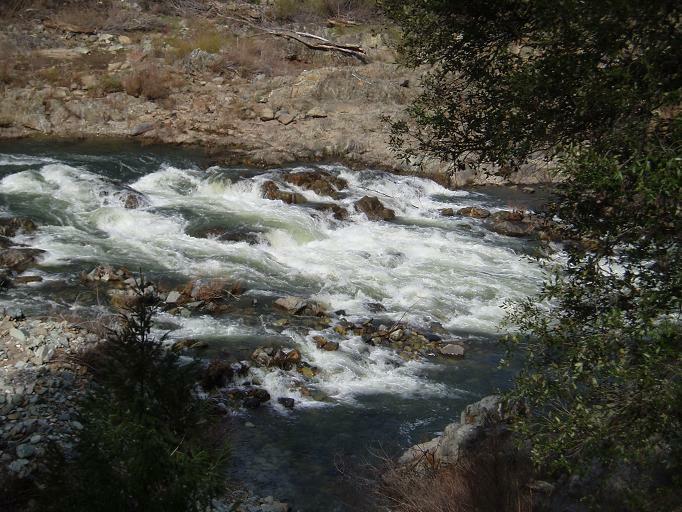 We found that although most of the rapids were class III to IV-, there was an occasional big one. We ran two solid IV rapids, then ran a borderline class V- rapid before one of our group dislocated his arm while paddling (didn’t even role, didn’t have his arms high, just was paddling, really bizarre) which caused us to spend the rest of the day trying to get him out of the shallow canyon and to a hospital, thus not finishing the run. Apparently there was one more class V (so I was told later) rapid which can be viewed from the road (didn’t look like class V from up there though so who knows) and a long class IV rapid or two which also are visible from the road and didn’t look that bad. In total, I had a blast on this run while we were on it, and will for sure be going back to do it again when I get the chance. 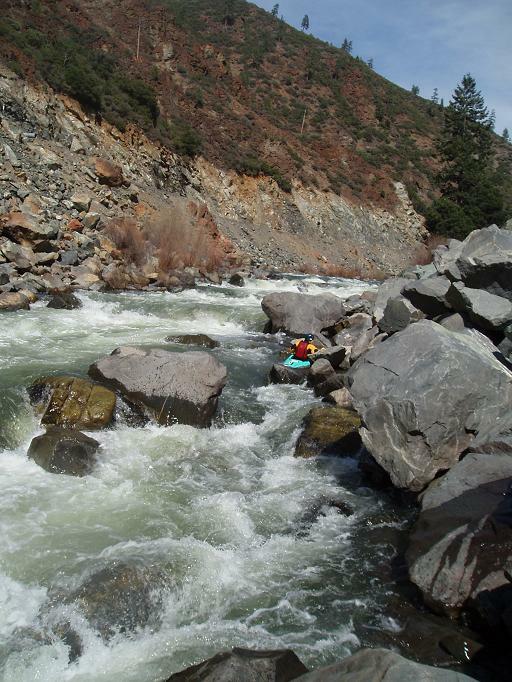 I would definitely take the time to road scout before getting on the run as many of the rapids require correct lines or big holes/rocks await you. All the big rapids that we ran, as well as the biggest of the ones down river can be viewed from the road (unless the local who gave me and Louis the hitch neglected to tell us of some). Thanks to Darin McQuiod for sharing some photos. 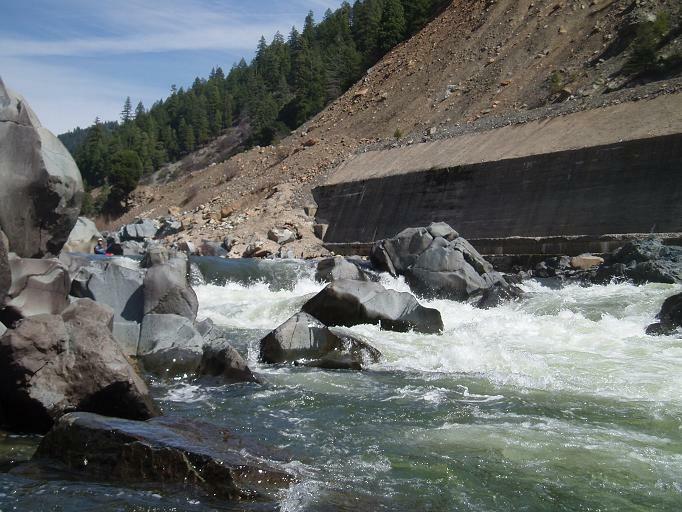 Also note, Darin's photos were taken at a lower flow of 650 cfs. Put in (III). So we put in just above a spot were the river falls into a bedrock channel. We decided to portage the first hole in it as it looked pretty bad, and we had 10 miles to do on a unfamiliar run, starting at 2:30 in the afternoon. We were able to portage via the island in the center. The run out of the rapid was read and run through holes. If the first hole is run the rapid is harder than III. Get Right (IV to IV+). As long as you make the move, this rapid is easy. The rapid runs down a tongue and slams into a rock. 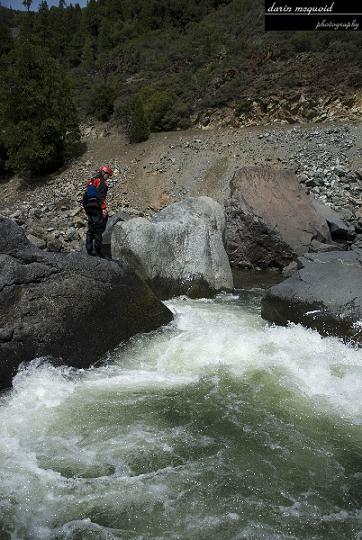 The left side of the current drops into some very large holes while the right side slides off into a few more rocks. The move is to cut across the tongue and catch the small eddy on the right. This allows you to not get pushed up against the rock and flush off either way. Once you make the eddy peal out of it and run the hole, avoiding any shallow rocks lurking to hit you. Three Choices (IV). 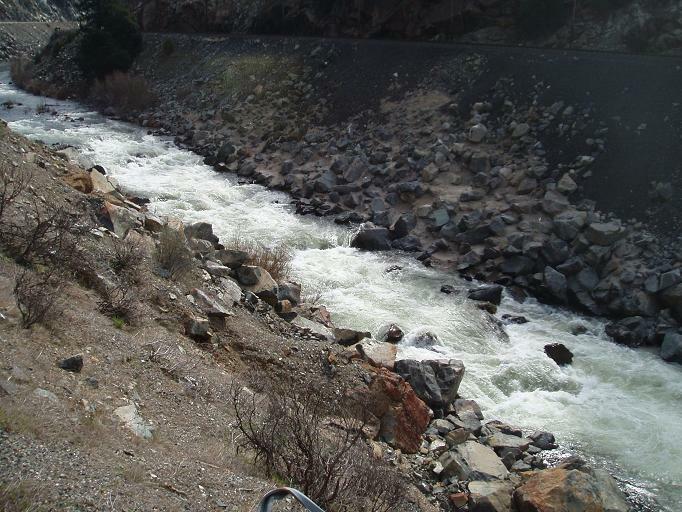 The river comes to a dramatic horizon line, a eddy with scout access is on the left below a pipe hanging over the river. The left side drops into a massive hole sided by a wall, the center goes over a large pour over, and the right which cant be seen from the road is a clean chute which is then backed up by a few rocks. It is easiest to stay right of the rocks. Apparently below 900 it is best to go left as there is a good chance of pitoning in the center (thanks Lance). At 650 Darin reported that the left is meaty, and the center was fine as lon as you boof. Little One (III-). 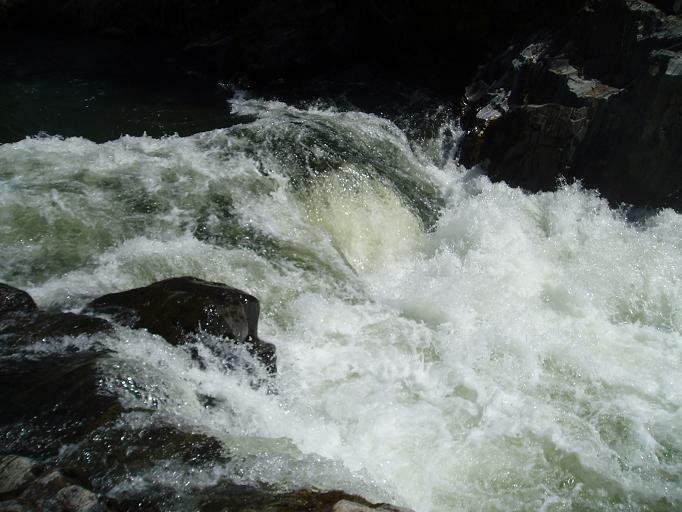 A small rapid with a few large holes in it, we ran from the right to the left. Be aware that there is metal in the river in this section. Once rapid that is a long class III has a huge chunk on river left just barely out of water at 1000 cfs. Also, As we were scouting "Five in a Hole," the banks were covered with small pieces. So be careful. Five in a Hole (IV+ to V-). The river gorges up with baron walls, you can see the train tracks have rock protectors on them now. 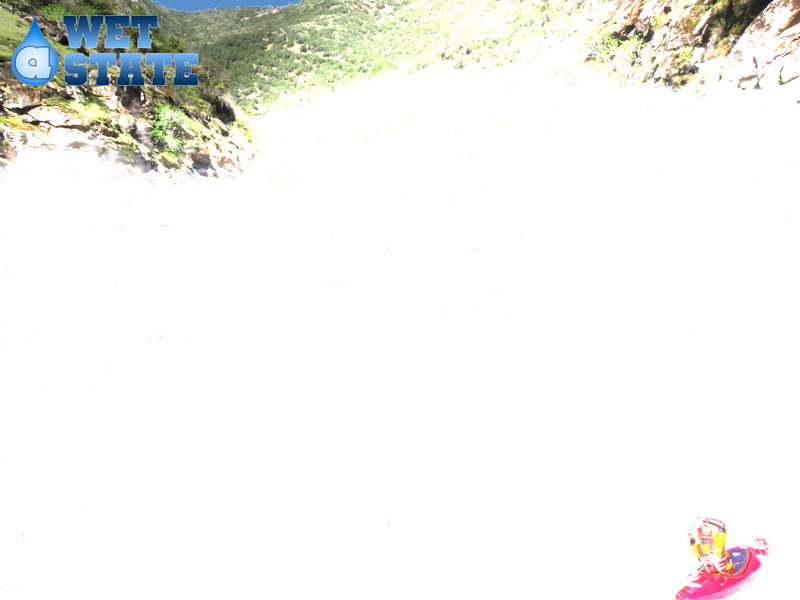 The rapid was very long and necessary to scout to pick a line that wouldn’t lead you into a massive hole. 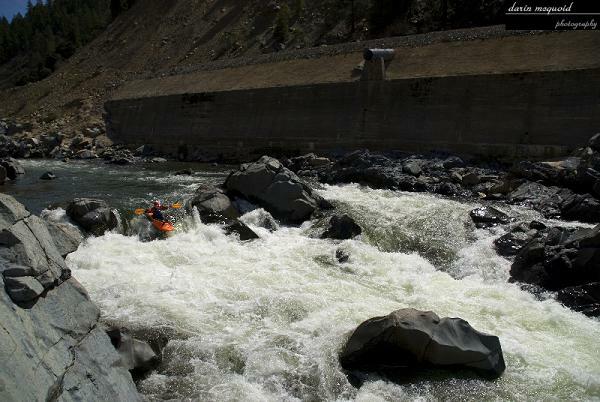 The line was to avoid the initial two holes to the left (looked a lot smaller from the road), then we sprinted right went through another ledge, then eddied out behind another large ledge, coming around its right side, and caught an eddy on the left side of the river. The river then drops into a large hole, which by how deep the water was going, I can imagine at higher flows this rapid is scary as hell. We ran the sneak left channel around this hole. From here the rapid continues for another 100 yards, but it is all read and runnable. Skipped (IV+?). So we didn’t get to run this one as a group member dislocated his arm in the Big One. 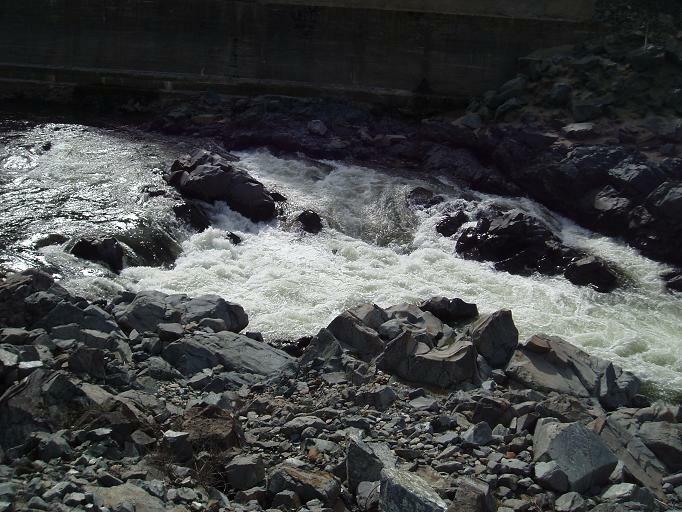 The rapid is formed between massive boulders with constricted channels. 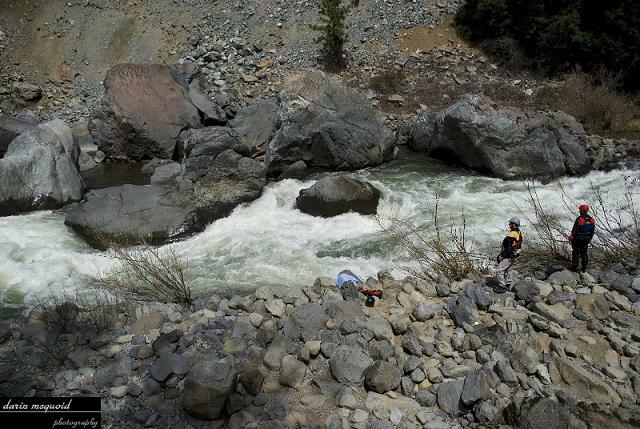 It looked like it would possible to drive onto the cushion on the left side of the river, and boof the hole, but this scout was done from road, so who knows. Here is some beta from Lance Petrack-Zunich: This is house rock and is class 5 and has a huge sieve there. The water there is 50/50 make the move or go into a bad place, it used to be good but after 2006 rains and high flows the rock moved more into the center channel. Here is some beta from Darin McQuoid: The first pic is Scott and Nate scouting the last big one, it does have a major sieve in it. I was probing and ran through it blind with no problems, it's not too hard to stay in the water that exits where you want to go. 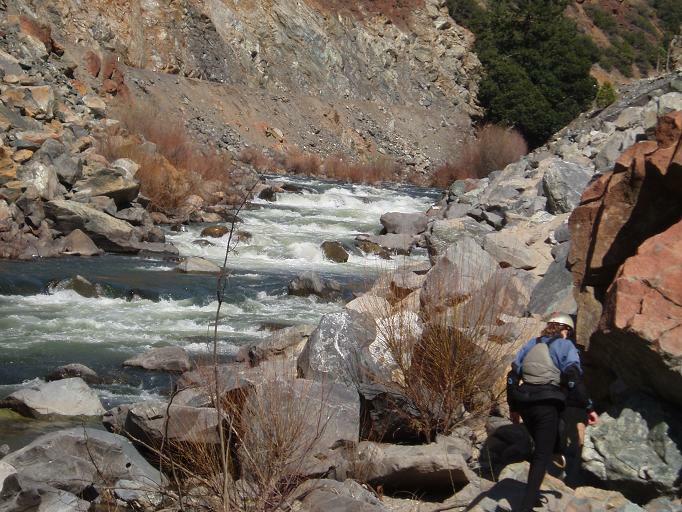 The second picture is Scott scouting it, the sieve is just downstream of the rock he is standing on. The crux move is just making sure you have right angle and momentum when you go by the rock he is on. 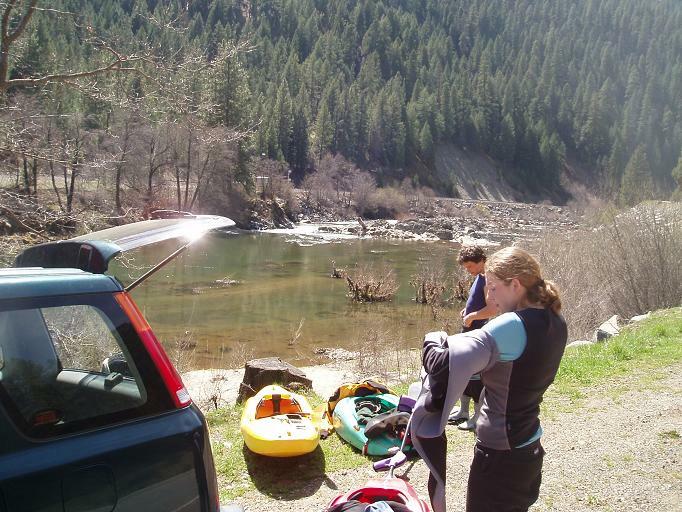 Put in: We couldn’t find the put in described in Stanley/Holbek, so we drove about 9 miles downriver from Indian Creek, until we saw a 6’ ledge, and put in there along the side of the road in a small turn out. The upriver sections didn’t seem to have much action, we only saw one rapid that we missed, and it was a nasty looking ledge that we probably would have walked anyways. Virgilia to Rich Bar Road. You Can do just the class IV section of the run and take out. Making for a more exciting 4-5 mile run. Rich Bar Road to Belden. Class III. 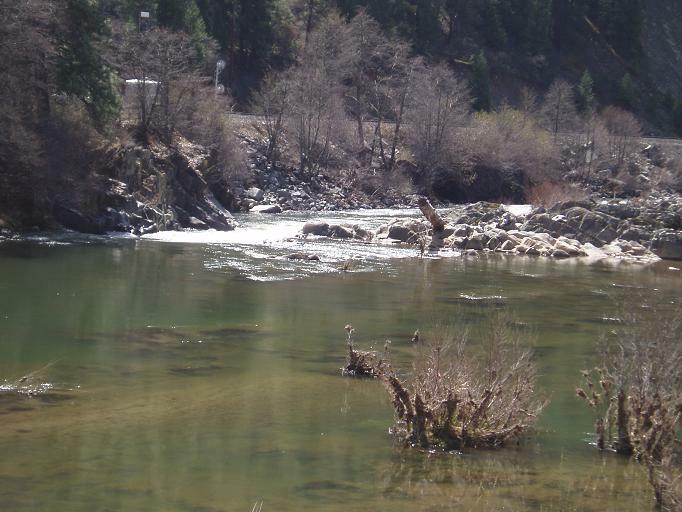 The last half of the Virgilia to Belden run can be run separately for class III boaters. The put in is the same as the take out for the run above. Supposedly this is a good beginner run.